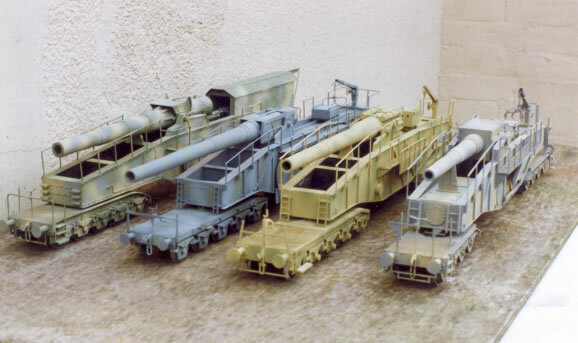 These four models were part of a set of 9 railguns made some time back for a customer. They are a 24cm Theodore Bruno, 28cm Kurze Bruno, 28cm Schwere Bruno and a 28cm Lange Bruno. These were all made in the usual way of making all the wheels and fitting wheel flanges from card, springs from 1/8 x 20 th strip and the axle boxes from tube. Painting on all the models was different to add to the interest but probably not very authentic.